I wanted to make some masculine cards. I seem to want to put flowers on everything, so when I took my picture, I still had to sneak them in. I created this card by taking a white card panel and using a water brush, adding in three of the colors to the top middle of the panel. I then die cut the "You" from some rust cardstock three times and glued them together with some liquid glue. 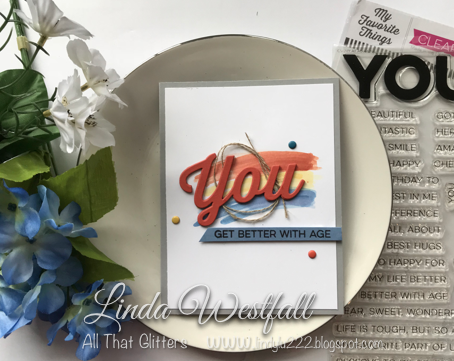 I stamped the sentiment from the "All About You" set onto some blue cardstock with black ink. I adhered these to the card panel with some linen thread. Then to a gray card base. I added a couple coordinating dots, but not any flowers.